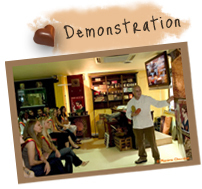 A presentation about the origin and history of chocolate, as well as the manufacturing of pralines and caraque chocolates. Informative, humorous and with a pleasant atmosphere. During the demonstration, visitors have the opportunity to observe our master chocolatiers through the windows of the atelier. Explanations are followed by some delicious treats of handmade pralines and hot chocolate. A master chocolatier takes care of the participants. 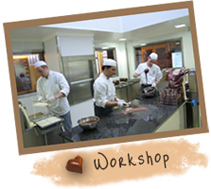 They can enter our workshop and make their own pralines – starting from pouring the chocolate into the mould to taking them out. Each person receives a small gift, a bag with the pralines that were made during the workshop! This is a guided tour through the streets of the center of Brussels. During this tour, participants can discover some of the city’s most famous monuments like the Manneken Pis, the Grand Place and the Saint-Hubert Galleries. Along the route, participants can also take part in entertaining little games, in form of trivia questions. It is an original way to get to know some of Brussels cultural treasures. – Planète Chocolat is Coming to Your Event! Are you organizing a fair, a wedding, a reception, an exhibition, a business meeting, a sales event, a regular meet&greet or a festival in your village? 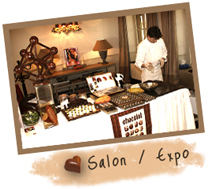 The Planète Chocolat-Team is coming to your event! You do not have to worry about anything – we bring all the necessary equipment along. We'll do all the hard work, meaning you can enjoy yourself and make the most of your time with your guests and our delicious chocolate! 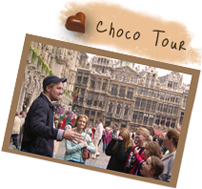 With 55,000 visitors per year, Planète Chocolat has become a vital stop on any tour of Brussels's gastronomy as well as an ambassador for quality Belgian chocolate.